I had a close encounter with a giant cat once. We had caught a five pound Zander in the Danube that was coming home with us for tea, so we put a wire through its gills and floated it off a convenient iron stake that I might point out was behind us, as we had wet waded into the river. Twenty minutes later there was the most gigantic swirl, an audible ping as the wire snapped and the post was left leaning at a crazy angle downstream. ‘Catfish,’ announced my friend tersely. Without any further discussion, we took several steps backwards, as one does on these occasions when the predator/prey equation needs to be recalculated. By the look of the post, it had been a really big wels and in the Danube - and given that Russian trawlers frequently net wels weighing up to 600 lb, discretion did seem to be the better part of valour. According to John Langridge, 600 pounds may not be as big as Wels catfish go - a thousand pounder is on the cards, and given that the fish has been distributed right around Europe into waters which are really to its liking, like the Ebro in Spain, it seems more than likely that the present European rod caught record of just over 200 pounds is going to be smashed. The Complete Book of the Giant Catfish is a masterly review of the current state of knowledge about all the big cats, right around the world, beginning with a run through the historical literature, before moving onto their biology and habitat and finally how to catch them. 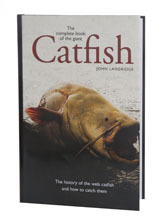 The historical section is great fun, there being more legends about catfish than any other predator apart from the pike, but the rest of the book is no less entertaining and you even get half a dozen pages of recipes. Catfish ain’t pretty, but they make great photographs and there are one or two in here that make me damned glad I didn’t wade any deeper into the Danube. Even if you aren’t interested in cats, this is a great book and Olivier Portrat’s pictures are worth the price alone - I would love to see more of them.